We have all on occasions been in or on salmon pools in our careers that are simply stuffed with salmon albeit totally unresponsive ones unless you're a complete sub surface salmon fly fishing specialist who knows exactly how to unlock the safe in such situations. Over fishing & a lack of salmon fisher stealth will no doubt have much to do with the above scenario. 'Little and often' is the best approach as far as the fishing effort pressure goes in the above senario but that is seldom actioned as the majority of salmon anglers and ghillies don't think like that. If you bombard salmon too often they will completely switch off and the best chance will lie with the first angler through the pool each morning then it will become fairly difficult thereafter for anyone else. Halving the angling pressure in situations like that will double the catch return which I've personally witnessed on many occasions over the decades. Salmon pool rotations on many Scottish salmon beats are robotic and don't usually go much further than "you're here until 11am then walk down to the next pool and fish there until lunchtime". When salmon are present and proving 'tricky' the last thing you want is to hit them too hard and one properly spaced swing through the pool is always going to produce better results than multiple runs through just because an angler has the time on that pool to do so. Look at this photograph of the beautiful Junction Pool on the River Tay's Lower Kinnaird salmon beat. 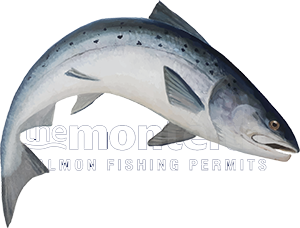 Most south approaching salmon anglers would just crunch their way quickly straight up the side of the river eager to get to the neck of the pool before fishing back down to the tail of the pool. That little dark seam of stream you see that's located 5 yards from the edge of the riverbank would be completely compromised and that type of stream is exactly where a few running fish that are eager to take a fly could be temporarily holding had a more stealthy and thoughtful approach been deployed. A slow wider berthed walk up to the neck of the pool in a big half circle route away up behind the bushes that are visible would keep your pool intact and not diminshed you're chances of moving on some shallower stream holding salmon that could have been fairly easily connected with. On the riverbank I'm personally a complete 'fanatic' for stuff like this and every movement and shadow I make is carefully considered however I do get my fair share of salmon takes so a sub surface endorsement is usually not too far away!